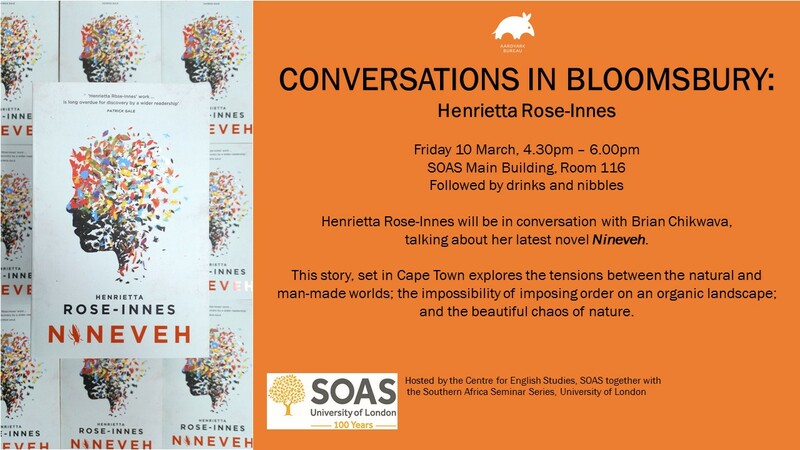 Edited excerpts from the Conversations in Bloomsbury event (March 10, 2017), held at SOAS, London, and which hosted Henrietta Rose-Innes and Brian Chikwava. When Brian Chikwava and Henrietta Rose-Innes found themselves at SOAS for a Conversations in Bloomsbury event last Friday—about the latter’s latest novel to be published in the UK—their audience was carried from Nineveh, the ancient Assyrian city of Upper Mesopotamia (the historical, geographical city space from which her book takes its title) to the Cape Town-set artificial luxury estate, Nineveh, that Rose-Innes invents, and finally, to Nineveh, her novel, which was first published in South Africa about six years ago, and is now “having this second life,” reincarnated, reread, and reinterpreted (“a hyper-local story has no value to its readership,” she says) in its 2016 publication. And although this tale travels, and triangulates the world (incidentally, Nineveh is “the first in a very loose trilogy”), its author always finds her way to the coordinates of Cape Town: “I like to think of myself as an author of the particular, the local, and it’s one of the ways I imagine my contribution to South African literature—by documenting and exploring one quite particular site, Cape Town—which is also one of the ways you can make sense of yourself as being a writer in an environment such as South Africa,” says Rose-Innes. For Zimbabwean writer, Brian Chikwava—who was all praises for his friend, and fellow literary comrade from the community of Caine Prize winners—the “story is very much like a potted plant… in a way that it is very self-contained,” he says. Rose-Innes, who is currently working on her next novel, reveals that it too is, in fact, about “potted plants”—and thus particularly enjoys the reference in Chikwava’s reading of Nineveh. However, this strategy of a self-contained story, she adds, goes to the very roots of her work as a writer—and more specifically, a Cape Town-centric, South African writer. “It’s self-contained and I think that was a deliberate strategy of mine; and it is, indeed, a result of having been writing for quite a long time now…It’s not my strength as a writer to coordinate large complex casts of characters, and part of the appeal of long fiction for me is the challenge of trying to coordinate a large theatre,” she admits. Nineveh, for Rose-Innes, was a turning point, and her transitioning, as a writer: “The writing I’ve been doing in recent years has been more and more self-consciously environmentally-minded… I didn’t start out writing a book deliberately about ecological issues. I had wanted to write about the complexities of urban living.” But she increasingly came to realise how the human and non-human worlds are intertwined and inseparable, and therefore, transitioned “out of writing about exclusively the human into a more expansive vision of what the human actually is…” When asked about the specific triggers for the book, Rose-Innes mentions that inspiration usually comes from rather “specific visual images” that she stumbles upon. Living in Cape Town, it was the degradation of the natural environment, and gentrification of urban spaces, which composed the background noise to the novel—and this alongside objects housed at the British Museum in London, and insects “which announced themselves” on her walks in Cape Town. 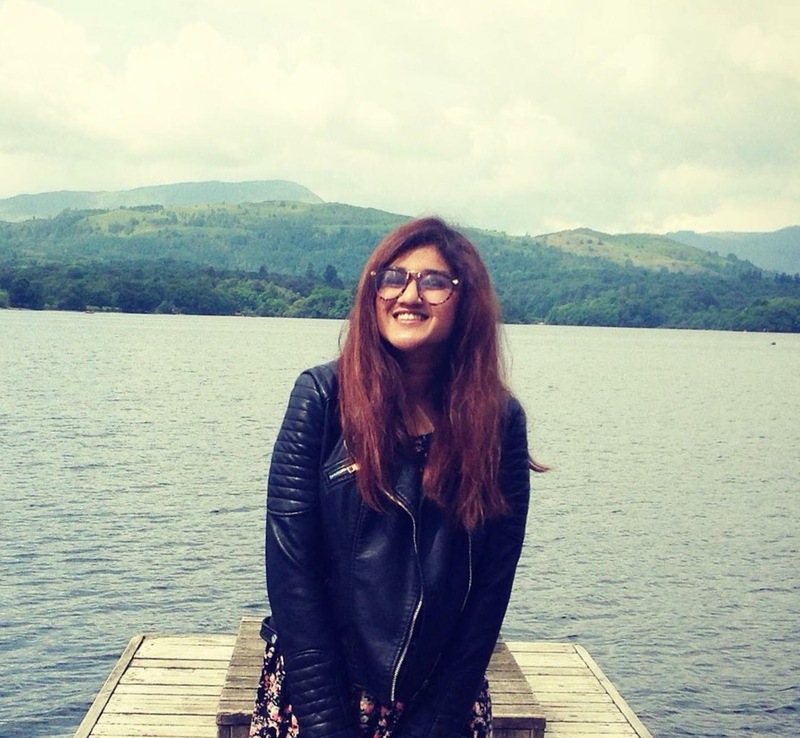 At the time of writing, she felt that the city, and the country, was in a state of uncertainty—and the book was, “in part, a way of [her] coming to terms with the social anxiety”. Re-reading it retrospectively, it’s clear to her that it’s about the “anxieties and challenges of living in human cities that are these hugely changing environments, these hugely changing ecosystems, and always have been,” she says. Nineveh was a city that was famously destroyed in an act of godly rage, but really, this manifests a “more universal act of our human coexistence,” says Rose-Innes, that, “these places that we build for ourselves to live in necessarily destruct, necessarily transform… and that is something to embrace.” In this regard, Cape Town, for the author, is “a very particular place, in that it does demonstrate great extremes”—and the parallels prove somewhat fruitful. 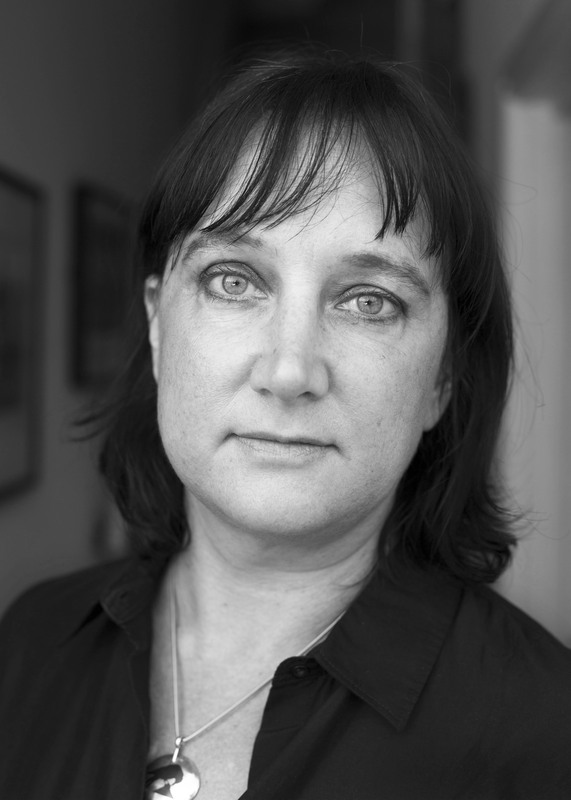 Rose-Innes reflects on Cape Town, and its “particularly fractious and contentious history”: “It has been many cities over the course of its life, and it has been changed and constantly changed many times over—as a colonial center to its incarnations under apartheid, and again, as a modern African city. There are many layers to the city—and over the course of its history there have been many attempts to impose different kinds of order on its substance—and a lot of those physical layers of the city have been actively suppressed as well, there are a lot of secrets underground.” Cape Town is a city that, in its very substance, “demonstrates violent changes that cities undergo cyclically,” she concludes, but this makes the city a particularly “loaded literary environment to talk about complex ecosystems and ways of inhabiting space”—and, in the end, is the city that Rose-Innes’ fiction always circles back to. 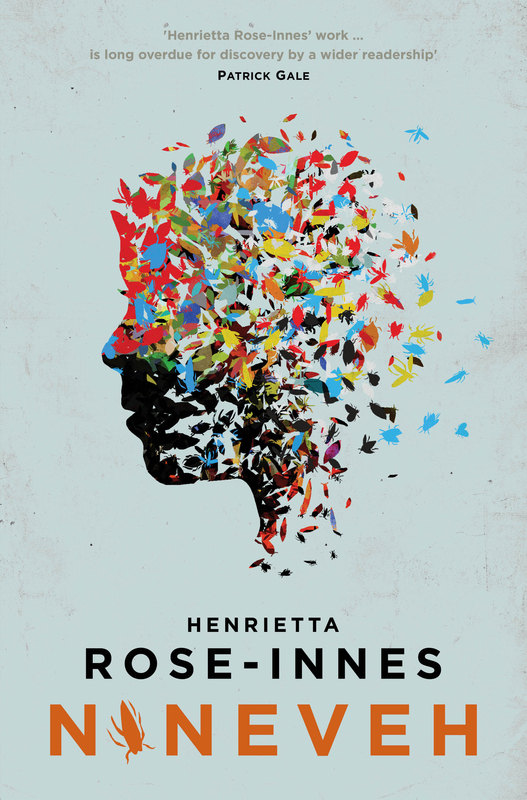 Henrietta Rose-Innes’ Nineveh is now available in the UK through Aardvark Bureau. Green Lion is scheduled to release summer 2017.